To Cite: Rezaei Kahkha M R, Kaykhaii M, Ebrahimzadeh G. Optimization of Affective Parameter on Cadmium Removal From an Aqueous Solution by Citrullus colocynthis Powdered Fruits by Response Surface, Health Scope. 2015 ; 4(1):e20667. doi: 10.17795/jhealthscope-20667. Background: Cadmium is a toxic metal that occurs naturally in the environment and is considered as a pollutant emanating from industrial and agricultural sources. Biosorption is a very simple and cheap technique for removal of metal pollutants from aqueous samples. Objectives: In this study, removal of cadmium from aqueous solutions using C. colocynthis fruit powder was studied. Materials and Methods: The effect of three parameters such as pH, initial concentration of cadmium and adsorbent dosage were optimized. For investigation of these parameters and exemption of optimal conditions the Box-Behnken design (BBD) was used. Results: The best results for percentage extraction of cadmium by C. colocynthis with BBD design was obtained at pH = 4.5, initial cadmium concentration of 31.22 and adsorbent dosage of 3.75 g/L. Analysis of variance (ANOVA) and R2 = 0.98 showed that the model was able to predict the removal of cadmium by C. colocynthis fruit powder. Conclusions: Results of this research imply that the adsorption of cadmium was enhanced, by increasing the cadmium concentration and contact time. Based on the ANOVA results, the models report high R2 value of 99% for cadmium removal, which is very high and advocates a high correlation between the observed values and the predicted values. Nowadays environmental pollution with toxic metals is an important concern for many researchers. Toxic heavy metals are released in the environment from a number of industries such as mining, plating, dyeing, automobile manufacturing, and metal processing (1). Cadmium is a toxic metal that occurs naturally in the environment and is considered as a pollutant emanating from industrial and agricultural sources (2). Adsorption is one of the methods for the removal of heavy metals from wastewater. Much work has been done on the removal of lead and cadmium by clays (3, 4), minerals such as calcite (5), calcareous soils (6), some industrial by-products and waste materials such as slugs, sludge (7), chitosan, dead biomass, modified wool, moss, peat, seaweed (8), and other biosorption techniques. Biosorption is a process that involves the use of biological materials for purifying industrial waste-water through formation of complexes with metal ions using ligands or functional groups (9). This process can be applied as a cost effective way of purifying industrial waste-water where drinking water quality can be attained. A lot of research has focused on bio-adsorbent materials, which can efficiently remove heavy metals from aqueous bodies. Cadmium in ionic form, Cd2+, is highly toxic to many organisms. The content of cadmium in drinking water should not exceed the recommended safe limit of 5 μg/L (10). Uptake of cadmium in excess may cause a painful bone disease, known as Itai-itai. In this work for removal of cadmium from aqueous solutions or waste-waters in a batch reactor system powdered fruit of Citrullus colocynthis was used. Citrullus colocynthis is a common wild plant that grows in hot and dry zones and its fruit is similar to peanuts. For understanding the interactions between these parameters a statistical experimental design method called the response surface methodology (RSM) was employed. Response surface methodology is a collection of mathematical and statistical techniques useful for developing, improving and optimizing processes and can be used to evaluate the relative significance of several affecting factors even in the presence of complex interactions (11). The main objective of RSM is to determine the optimum operational conditions of a system or to determine a region that satisfies the operating specifications. Another objective of this study was to use RSM to find an applicable response function for predicting and determining further response and obtaining an optimum condition. For optimization of parameters the experimental data points were used to obtain an experimental model from the Box-Behnken design. The two most common designs extensively used in RSM are the central composite design (CCD) and the Box-Behnken design (BBD). The BBD is ideal for sequential experimentation and allows a reasonable amount of information for testing the lack of fit while not involving an unusually large number of design points. Box-Behnken design was applied for removal of cadmium and other heavy metals by several bioadsorbents such as Synechocystis pevalekii (12), carbon aero gel (13), Bacillus brevis (14) and Trichoderma viride (15). In the present investigation, batch experimental studies were carried out for the removal of cadmium from aqueous solutions using C. colocynthis fruit powder. Experimental data points were used to obtain an experimental model from the Box-Behnken Design (BBD) in response to surface modeling. The input parameters for determining percentage removal of cadmium are pH, initial concentration of cadmium and adsorbent dosage. The optimization process was carried out using BBD to optimize the input parameters for maximum cadmium removal. About 30 samples of C. colocynthis were gathered during summer from central Zabol, located east of Iran. Samples were washed and dried in the oven at 70°C for 24 hours. After separation of seeds, fruit samples were crushed with a mortar, and then milled in a crushing machine to obtain a uniform and homogeneous powder. Finally the products obtained were stored in glass bottles for further use. All the materials were obtained from Merck Chemicals (Germany) and no pretreatments were performed. Next, a metal solution was exposed to the plant powder, the existing dross was removed from the solution, and finally its absorption rate was measured using an atomic absorption spectrometer (Shimadzu AA 7000, Japan). Measurement of pH was performed using a Metrohm (Switzerland) model 827 pH Lab. Variables such as initial concentration of metal, pH value of the solution, and adsorbent dosage were optimized. The obtained values were pH of 4, initial cadmium concentration of 30 and adsorbent dosage of 4 g/L. The reaction time of absorption was determined to be 360 minutes. The solution containing adsorbent and adsorbant was poured in a 250 mL beaker and stirred at 300 rpm on a mechanical shaker for a predetermined time. The adsorbent was decanted and separated from the adsorbant using filter paper (Whatman no. 40). Where Ci is the initial concentration of the cadmium solution; Cr is the remaining concentration of the cadmium solution; R is the percentage of cadmium absorption. Where Y is the response of the system and Xi, XJ is the variables of action. The quality of the polynomial model was expressed by the coefficient of determination, namely, R2 and Adj-R2. The statistical significance was verified with adequate precision ratio and by the F test. Design expert (version 7) program was used for regression and graphical analysis. A total of 15 experiments were necessary to estimate the full model (Table 2). Where Y is the yield of experiment, X1 is the pH, X2 is the initial metal concentration and X3 is the adsorbent dosage. The ANOVA values for the quadratic regression model obtained from the BBD and employed in the optimization of cadmium removal are listed in Table 3. The statistical significance of the second-order equation revealed that the regression is statistically significant (P < 0.0001); however, the lack of fit was not statistically significant at 99% confidence level. Table 3 depicts the significance of the regression coefficients and ANOVA for the regression model, respectively. The results indicate that the response equation proved to be suitable for the BBD experiment. The model’s F value (485.11) in these tables implies that the model is significant for the removal of cadmium. The fit of the models was controlled by the coefficient of determination R2. Based on the ANOVA results, the models reported a high R2 value of 99% for cadmium removal using C. colocynthis powdered fruits. In this study, a pred-R2 value of 98.48% was found, which is very high and advocates a high correlation between the observed values and the predicted values (Figure 1). This indicates that the regression model provides an excellent explanation for the relationship between the independent variables and the response. 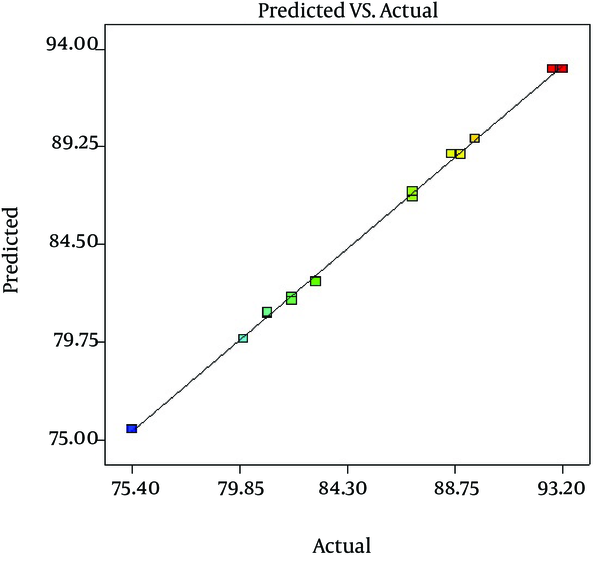 The actual cadmium removal percentage value is the measured result for a specific run, and the predicted value is evaluated from the independent variables in the BBD model. Therefore this methodology could be successfully employed to study the importance of individual, cumulative, and interactive effects of the test variables in biosorption with C. colocynthis. The optimum values of initial cadmium concentration, pH and adsorbent dosage from Box-Behnken design were found to be 31.22 mg/L, 4.5 and 3.75 g/L, respectively. The maximum predicted adsorption of cadmium was found to be 94.10%. The percentage adsorption of cadmium by C. colocynthis fruit that was investigated with RSM is depicted in Figure 2. The results indicated that the maximum adsorption occurred in the acidic range and at low initial concentration of cadmium. The pH and adsorbent dosage are the most important parameters for assessing the removal capacity of an adsorbent. Adsorption experiments were carried out as per the selected model with a selected range of pH and adsorbent dosage. 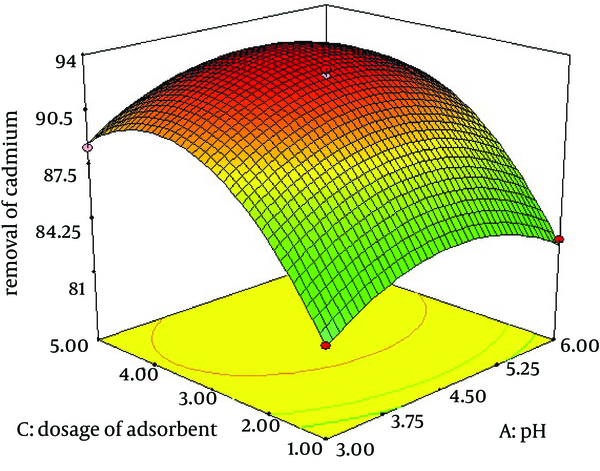 The maximum adsorption of cadmium was 94% by C. colocynthis at pH = 4 and adsorbent dosage 4 g/L (Figure 3). The combined effect of adsorbent dosage and initial concentration of cadmium are presented by Figure 4. The results show that the maximum adsorption was at the adsorbent dose of 4 g/L and lower initial concentration of cadmium. The results implicate that removal of cadmium by C. colocynthis is very effective. Influences of important parameters on extraction efficiency were investigated. 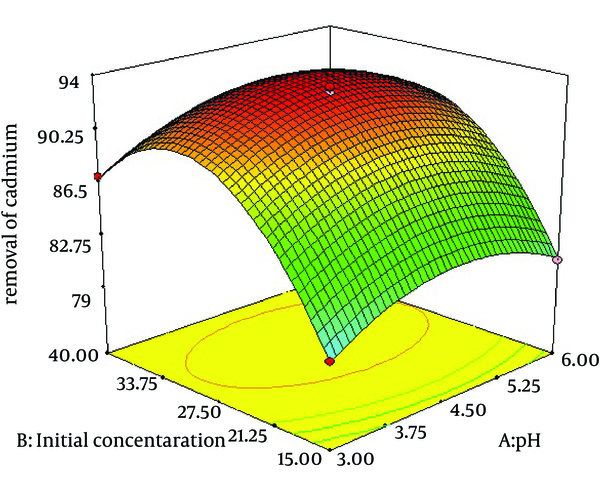 Effect of pH and initial concentration of the metal solution is shown by Figure 2. The results indicated that the maximum adsorption occurred at the acidic range and low initial concentration of cadmium. Also, pH is less effective than initial concentration of cadmium on removal efficiency. Figure 3 shows the effect of two-factor adsorbent dosage and pH on the elimination process of cadmium. At high adsorbent dosage, removal efficiency increased because complex formation between metal solution and adsorbent was optimum. Amini et al. also reported similar results for biosorption of cadmium with Aspergillus niger. The optimum values of the variables were found to be 5.96, 30.0 mg/L and 1.6 g/L for initial pH, initial cadmium ion concentration and biomass dosage, respectively (16). A similar effect was reported on cadmium biosorption by an aqueous solution of Saccharomyces cerevisiae. The best set required an initial pH of five, 3.8 g/L of S. cerevisiae and cadmium ion concentration of 19 mg/L and 240 minutes of contact time. An optimum cadmium uptake of 6.71 mg/g biomass was achieved at initial cadmium ion concentration of 26.46 mg/L and S. cerevisiae dosage of 2.13 g/L (17). Trichoderma viride as an adsorbent was used for biosorption of lead (II), cadmium (II) and copper (II). Biosorption of ions from aqueous solution was optimized in a batch system using the response surface methodology. The values of R(2) were 0.9716, 0.9699 and 0.9982 for lead (II), cadmium (II) and copper (II) ions, respectively, indicating the validity of the model. Table 4 shows similar results reported previously for biosorption of cadmium and other heavy metals. The removal of cadmium was investigated by a bioadsorbent. Use of plants for removal of heavy metals from aqueous solutions is a useful technique that effectively removes a variety of pollutants. Maximum adsorption of cadmium by C. colocynthis occurred in acidic media. This indicates that in acidic pH, dosage of adsorbent and initial concentration of cadmium ions plays an important role in the extraction of cadmium by this plant. An increase in the dosage of adsorbent partially speeded up the removal of cadmium until all of the active sites on the plant were saturated with cd+2 ions. The adsorption process was optimized using RSM based on BBD. The optimum values for pH, dosage of adsorbent, and initial metal concentration were 4, 3.75g/L, and 31.22 mg/L, respectively, where 94.10% cadmium removal could be obtained from the proposed model. The ANOVA showed high coefficient of the determination values (R2 = 0.9981 and pred-R2 = 0.9848). The authors hereby express their gratitude to the health laboratory personnel of Zabol University of Medical Sciences for their cooperation in conducting this research. Authors’ Contributions: Mohammad Reza Rezaei Kahkha, Massoud Kaykhaii and Gholamreza Ebrahimzadeh equally participated in the study design, data collection, analysis and writing of the manuscript. Funding/Support: This study was the result of a research project financially supported by Zabol University of Medical Sciences.